Prices of all the 348 medicines contained in the National List of Essential Medicines will now be capped barring drug makers from selling these at higher MRPs than those fixed by the government. 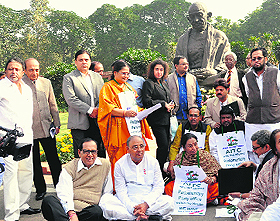 Top BJP leaders, who were invited for dinner by Prime Minister Manmohan Singh today to seek the cooperation of the principal Opposition party in the smooth functioning of Parliament, told him that they were not willing to relent on their demand for a debate on FDI in retail under rules entailing a vote. The CPM today gave a privilege notice in the Rajya Sabha against Commerce and Industry Minister Anand Sharma on the issue of FDI in the multi-brand retail sector. The Congress is speaking in two voices on the issue of Parliament’s right to debate executive decisions taken by the Cabinet. If cinema is not just meant for entertainment, film festivals are not for just screening films. On the third day of the International Film Festival of India, Goa, stars not only added lustre to the proceedings but also provided food for thought. Filmmakers Gauri Shinde, Rasool Pookutty and Aishwarya Dhanush address mediapersons in Goa on Thursday. Shiv Sena is going out of its way to tug at the emotional heartstrings of its cadres and supporters after the demise of Bal Thackeray. The party founder’s ashes have been divided into 100 urns that have been sent to different parts of the country and will be immersed in regional rivers. The Telugu film industry, ranked amongst the top in the country, has drawn a blank in the all-important Indian Panorama section of the ongoing international film festival in Goa. Following uproar after the arrest of two girls for posting comments on Facebook, the Maharashtra Government has sought cover in the ambiguous provisions of the Information Technology Act pushed through by IT Minister Kapil Sibal. On the occasion of Samajwadi Party patriarch Mulayam Singh Yadav’s 72nd birthday today, the Akhilesh Yadav government fulfilled another poll promise by waiving loans (up to Rs 50,000) of around 7.2 lakh farmers of the state. The obesity epidemic is sweeping Indian schools with half of the children aged between seven and 17 years found unfit to compete in sports events. The problem of bulge is more pronounced among children in Punjab, Haryana and Delhi. The Karnataka Government has not yet made up its mind on whether it should take part in the auction of a carriage said to be belonging to the Mysore royal family. The auction is scheduled to be held in the UK on Saturday. President Pranab Mukherjee on Thursday conferred the Indira Gandhi Prize for Peace, Disarmament and Development on former Brazilian president Luiz Inacio Lula da Silva here, hailing him for his outstanding contribution to the developing world. In a late evening decision today, the Cabinet cleared the new National Pharmaceutical Pricing Policy which will, for the first time, ceil the maximum retail prices at which any manufacturer can sell essential drugs that meet health care needs of the majority of the population. The concept of essential medicines was first introduced by the World Health Organisation in 1977. So far in India, prices of only 74 essential medicines are controlled under the Drug Pricing Control Order of the Ministry of Chemicals and Fertilisers. This number was 347 in 1979 when drug price regulation was first introduced. The latest Cabinet decision will allow prices of around 40 per cent of all drugs sold in India to be controlled. UPA sources said the move would reduce drug prices and encourage research in the pharma sector. The new pricing policy does not cover patented drugs yet. The important bit of the policy is that the government will now follow market-based mechanism to ceil cap the prices of drugs sold by local and foreign manufacturers. “Simple averages of drug prices of all manufacturers with a market share of more than 1 per cent in an individual drug segment will be taken as the MRP,” the policy says, abandoning the old cost-based pricing concept which is considered more rational. The Cabinet’s approval is the endorsement of the recommendations of Group of Ministers on Drug Pricing headed by Agriculture Minister Sharad Pawar. The GoM took seven years to give its recommendations. In its final decision, it abandoned the concept of cost-based pricing followed hitherto to control prices of essential drugs. The Supreme Court (which is hearing a PIL in the matter and which had set November 27 deadline for the government to formulate a new drug pricing policy) had directed the continuation of cost-based mechanism to determine prices of drugs. Under cost-based pricing, ceiling price of a drug is calculated by adding to the cost of its manufacture 100 per cent profit margin. “Cost-based pricing is most rational. Market-based pricing will legitimise the current exorbitant prices which drug makers are charging. There is ample evidence to show that drug makers jack up prices of essential medicines 50 to 70 times against their costs,” said Dr Anant Phadke of Jan Swastha Abhiyan which termed the new policy as a “rude shock” and a move to benefit pharma sector. Field evidence shows retail prices of several drugs is 10 to 70 times higher than their costs. If simple averages of such drugs are taken, prices would be much higher than they would be if cost-based systems were followed. For instance, Atrova (brand of Atrovastatin used for reducing blood cholesterol) is priced at Rs 104 (10 tablets) in contrast to other brands which sell 10 tablets for Rs 20. “How can a market-based mechanism be justified when the Supreme Court has rejected it,” asked Dr Amit Sengupta who works on price control. The government, however, said that with the new order, prices of several HIV, anti-cancer drugs, a range of painkillers and anti-TB drugs would fall significantly. Indian is the third largest drug producer in the world and exports to over 200 countries. In a move that will help lakhs of people residing close to the international borders and provide ‘last mile’ connectivity to troops, the Union Cabinet on Thursday approved a Rs 5,929 crore plan to provide connectivity to villages and habitations close to the borders with China, Myanmar and Bangladesh. The border habitations to get connectivity are in Jammu and Kashmir, Himachal Pradesh, Uttarakhand, Sikkim, Arunachal Pradesh, Nagaland, Mizoram, Manipur, Tripura and Meghalaya. The Cabinet Committee on Infrastructure (CCI) on Thursday approved a proposal for a policy framework for private participation in rail connectivity and capacity augmentation projects. The policy contains five models, including joint venture with equity participation by Railways, capacity augmentation through funding by customers, build, operate and transfer (BOT) and BOT annuity. While the BJP reiterated its known position at the dinner meeting, the government also held on to its stand that executive decisions were not voted on in Parliament. With no signs of a thaw on either side, Parliamentary Affairs Minister Kamal Nath will meet party leaders on Monday in a fresh effort to break the logjam. Veteran BJP leader LK Advani and Leaders of Opposition in the both houses, Sushma Swaraj and Arun Jaitley, who were closeted with the PM and his senior colleagues for over two hours tonight, went armed with files and documents to counter the government argument that executive decisions are never put to vote. Stating that it was incorrect to say there was no precedence of an executive decision being voted upon, the BJP leaders recalled that the NDA government had agreed to a debate and a vote on its decision to disinvest Bharat Aluminium Company (BALCO) in 2001. The Congress had then supported the CPM in pulling up the NDA government for going ahead with this move. The BJP leaders also recalled how the NDA had given in to the Opposition demand for a debate and vote that LK Advani, Murli Manohar Joshi and Uma Bharti should not continue as ministers because they were facing charges in the Babri Masjid demolition. The BJP has hardened its position on the FDI vote after receiving support from the Left parties. The Opposition realised that the UPA government was vulnerable on this front as its key ally, the DMK, is opposed to opening up the retail sector to foreign investors. The Samajwadi Party, which extends outside support to the UPA government, is also not in favour of this policy and will find it hard to vote in its favour. Both these parties have told the PM to avoid a vote on FDI as it would them in a difficult position since they will not be able to vote with the government. In the privilege notice, the Left party stated that the government had decided to permit FDI in retail in contravention of the assurance given by Sharma to the House on December 2011 that the decision was being suspended till a consensus was evolved for consultations among various stakeholders. The notice was filed by Prasanta Chatterjee, Deputy Leader of the CPM in the Upper House, and K N Balagopal. Yesterday, the BJP had moved a breach of privilege notice against Sharma over the same issue. The Congress is speaking in two voices on the issue of Parliament’s right to debate executive decisions taken by the Cabinet. Ever since the Opposition BJP and the Left hardened their stand on debating the government decision to allow FDI in multi-brand retail under rules that allow MPs to vote (Rule 184 in the Lok Sabha and 168 in the Rajya Sabha), the UPA ministers have been arguing that the Parliament doesn’t by precedence debate executive decisions. Commerce Minister Anand Sharma said this, followed by Parliamentary Affairs Minister Kamal Nath. Lok Sabha records, however, show that not only is there a precedence of the Parliament debating executive decisions, there is one such precedence where the Congress itself backed the CPM-led debate under voting rules against the NDA government’s decision to disinvest Bharat Aluminium Company (Balco) in 2001. The notice for the discussion was moved by Rup Chand Pal, CPM member in the Lok Sabha. It was voted upon and defeated, but the striking part of the story is that the Congress backed CPM on debating the NDA’s executive decision and censuring NDA for disinvesting Balco. Important also is to see the trust the judiciary repeatedly reposed in Parliament for debating critical executive decisions. “In 2001, the Delhi High Court trusted Parliament on Balco disinvestment issue and kept the decision pending for parliamentary debate to finish,” Yechury said. Even in the instant case involving FDI in multi-brand retail, a PIL was recently admitted in the Supreme Court. It was following the SC intervention that the RBI issued a notification amending the regulations to permit FDI in multi-brand retail. “The amendments were gazetted on October 30 and the court said there was no reason to fear that the government would not place these amendments in Parliament. The SC even opined that since the Parliament session was to begin, the said appeal matter must wait its decision. It is in this very same spirit that the government should even today agree for a discussion under rules that entail voting and let Parliament decide on the FDI matter,” CPM leader added. Chai N Chat, a unique initiative moderated by Dhritiman Chatterjee, a force to reckon with in the realm of Bengali cinema, known for his acting in films of stalwarts like Satyajit Ray and Mirnal Sen, became one such platform. The forum saw actors like Vinay Pathak and India’s import to Hollywood Kabir Bedi among others share their opinions. While pertinent questions like what is the purpose of festivals, should festivals like IFFI, Goa, be restricted to one city were raised, the enthusiastic discussion moved way beyond and encompassed many more concerns. Kabir Bedi talked of how in times to come the Internet will become the biggest leveller and could bring communities bound by shared interests together to watch cinema. On the dividing line between television, cinema and theatre he opined that while theatre teaches you the craft, television makes you popular and cinema immortalises you forever. Vinay Pathak who can easily be counted as one of those actors who have changed the grammar of acting spoke of the challenges of small cinema. Oscar winning Resul Pookutty talked of independent thought in mainstream cinema. He was accompanied by filmmaker Onir of My Brother Nikhil acclaim, director Gauri Shinde of English Vinglish fame and Aishwarya Dhanush daughter of superstar Rajnikanth and director of the movie 3. The underlying thought of all discussions, including that involving Shyam Benegal, was the need to find a market and to take films to the right audience. Regional cinema and its limited reach, particularly of Assamese cinema, whose market is rather small was a point that was driven home by none other than Jahnu Barua. His film Baandhon that is Waves of Silence had won the hearts of the viewers as the opening feature film of the Indian Panorama section. Jahnu also considered it remarkable that the day of Kasab’s hanging (November 21) coincided with the opening of the film which is his statement against terror. If the limited market for independent cinema was the lament of makers in general, it was surprising to learn that only a handful number of films are being made in Vietnam. Vietnamese filmmaker Pham Nhue Giang informed that not more than ten or 15 films are produced in her country and the kind of cinema she is associated the number is even lesser. That’s why festivals like IFFI where Giang’s film Mother’s Soul is being screened become important. For cinema is not to be judged on the yardstick of quantity only of quality. So proved Shyam Benegal, maker of films like Ankur Nishant and more recently Welcome to Sajjanpur. Speaking at the Master Class, he held that it’s erroneous to assume that only one kind of cinema is entertainment. Expanding the definition of entertainment, he talked about the need to engage with the audience. At the same time he stressed that the government has no business to be in entertainment but certain films do need a push. Soul of Asia: Cinema & Mysticism was inaugurated with the screening of Samsara, a film directed by Pan Nalin. It narrates the story of a Buddhist monk’s quest for enlightenment. 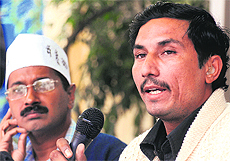 Kejriwal and Singh stood their ground following the MoD statement. He termed the statement a “white lie”. “So far there has been no correspondence on these issues, which means these decisions must have been taken after our press conference,” he said. In Maharashtra, the urns have been given to district chiefs of the Sena and elected representatives such as MPs, MLAs and councillors who have been tasked with taking them to a common place for a few hours so party workers and supporters could pay homage. "Lakhs of party workers and supporters who came for Balasaheb's funeral at Shivaji Park on Sunday returned home disappointed as they could not get ‘darshan’. But now they can come to the party office and pay homage," says Ashok Patil, a Shiv Sena leader at Dahisar in North Mumbai where the ashes will be put up on Friday for the public to pay respect. Huge posters announcing the arrival of the urn containing Thackeray's ashes have been put up in the area. In addition, handbills have been circulated at housing societies exhorting residents to come out in large numbers to pay homage to the departed leader. Shiv Sena leaders say the exercise has helped draw a lot of workers and supporters to the party offices in the neighbourhood. "People are coming in large numbers to pay homage before Balasaheb’s ashes are immersed," says Patil. Party leaders say they have drawn good crowds across the state. Even areas such as the Konkan where the Shiv Sena is facing a tough fight from former leader-turned Congressman Narayan Rane, public participation has been enthusiastic, say sources. On Friday, the urns displayed in Mumbai will be taken for immersion. 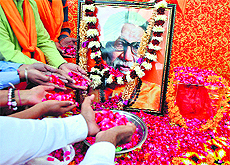 One of the urns has been kept at Matoshree, the Thackeray residence. The Sena has also been allowed to keep Thackeray's cremation site at Shivaji Park as it is till the 12th day of the funeral. 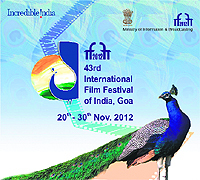 The bigwigs of Tollywood, as the Telugu movie industry is known, are feeling let down as not a single Telugu film could make it to the 43rd International Film Festival of India (IFFI- 2012). For an industry that brought laurels to the country by producing some of the finest movie artists and directors, the latest snub is hard to digest. The Telugu film industry churned out 192 films in 2011, compared to 206 Hindi films. This was followed by Tamil film industry with 185 films. As many as nine Telugu movies were sent to the central committee that scrutinised the films. “While some of them had a routine theme, the others lacked the technical quality to make the grade because films from other languages were simply better in many aspects,” said PK Manvi, a producer-director. “A comment which is normal to one person could be offensive to another. It is difficult to interpret the provisions of the Information Technology Act,” Patil is said to have told the Maharashtra Cabinet on Wednesday. Following Patil’s statement before the Cabinet, the Maharashtra Home Department is likely to communicate to the Central Government the need for clarity in implementing the Act, sources say. Earlier the government had come in for criticism after the police filed charges of sedition against cartoonist Aseem Trivedi. It suffered further humiliation after the two girls from Palghar were arrested for a post on Facebook. The arrest has kicked up a storm with supporters of free speech publishing even more critical material about Shiv Sena leader Bal Thackeray and others on social networking sites. Even the Maharashtra Government is divided over the arrest of the girls with Congress leaders criticising Patil for the decision of the police. Some ministers in the Chavan cabinet went on to say that the police action was illegal and the local police at Palghar were acting as representatives of the Shiv Sena. It is also being insinuated that Shaheen Dhada, who posted the item on Facebook, was targeted because she belonged to a prominent Muslim family in Palghar. With civil society joining in, online petitions to the Director General of Police for dropping charges against the two girls are gathering steam. Nearly 10,000 persons have signed a petition which would be sent to the DGP shortly. While expressing his “huge satisfaction at the punishment meted out to the terrorist”, Unnikrishnan said the cops who engaged Kasab’s group and managed to catch him alive had shown exemplary courage. “This is my one good memory of the incident,” Unnikrishnan, a retired ISRO employee, said. Without naming Pakistan, he said it should abandon its evil designs and stop “masterminding” terror attacks against India. An announcement to this effect was made by the Chief Minister at his official residence. The move would cost the state around Rs 1,650 crore. “While some provision had been made in this year’s budget, we will mobilise additional resources very soon to facilitate smooth implementation of this pro-farmer decision,” the CM said. The step would benefit only those farmers who have taken loans from “sahkari gramin vikas” banks (government cooperative banks) which extend loans against land mortgage. The other eligibility criterion for availing the waiver is that the farmer must have already repaid 10 per cent of the loan before March 31, 2012. Though most children can walk or run non-stop for five minutes, 40 per cent do not have the anaerobic capacity (fitness level to perform well in events like sprinting) that require them to have great performance in short bursts of time. “Nearly one in two children has poor flexibility levels and body strength making them unsuitable for most sports. As many as 49.9 per cent have low flexibility, 42 per cent have low abdominal strength, 65 per cent do not have enough explosive power in their upper bodies and 54 per cent do not have enough strength in their lower bodies,” finds the third annual edition of EduSports (a school sports education company) fitness survey. The survey for session 2011-12 covered 49,046 children from 104 schools in 54 cities across 18 states. The students were assessed for seven fitness indicators-endurance, anaerobic capacity and explosive power, flexibility, body strength (upper, lower, abdominal) and body mass index (BMI). Children in Punjab, Delhi and NCR, Rajasthan, Uttar Pradesh and Haryana were found to be more obese than the rest. In these states, 24 per cent children possessed high BMIs compared to the national average of 19.9 per cent. The findings are significant as these involve future of Punjab and Haryana, the states traditionally known for high fitness levels among their masses. The low fitness level is being blamed on lack of basic skills to play sports, unhealthy eating habits and sedentary options available for entertainment through TV, Internet and video games. Importantly, children in non-metros have been found to be fitter than those in metros. While one out of every four children in metros is overweight (24.9 per cent obese or overweight), only one out of six is so in non-metros. Additionally, children in non-metros demonstrated better anaerobic capacities. Non-metro children performed better on flexibility also. "A decision was taken in principle to take part in the auction. But no government order has been issued so far. Issuing an order means we shall have to earmark some funds for the auction. This has not been done," a top official said. "We are still waiting for the government order," said Mysore DC PS Vastrad, who is also executive officer of the Mysore Palace Board. "One can participate in the auction on-line also," he replied when asked about the paucity of time for taking a decision regarding participation in the auction. The auction, being organised by the cars and motoring memorabilia specialist auction house Historics at Brooklands at Weybridge, Surrey in the UK, on November 24, is primarily meant for automobiles with several exquisite vintage motorcars featuring among the exhibits. The auction house claims the 200-year-old horse-drawn state carriage belonging the royal family of Mysore, was also used to transport European royalty, including Queen Victoria and the Prince of Wales (later King Edward VII). It "could easily be described as a work of art", it said. According to the auctioneers, the carriage is expected to fetch around 70,000 to 1,00,000 pounds. Mukherjee said the award celebrated India's late Prime Minister Indira Gandhi's legacy as an untiring crusader for global peace, universal disarmament and a new international economic order. "Indira Gandhi would be remembered for her untiring efforts at maintaining cohesion, unity and enhanced economic cooperation among developing nations," he said at the event in Rashtrapati Bhavan. Mukherjee described Indira Gandhi, who was Prime Minister for 16 years in two spells, as "an outstanding champion" of the developing world. 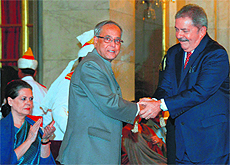 He noted that during Lula's presidency, relations between India and Brazil steadily progressed. The seeds were also sown for several international fora such as India-Brazil-South Afria (IBSA), Brazil-Russia-India-China-South Africa (BRICS), G-20 and Brazil-South Africa-India-China (BASIC).